My investment home at 586 Lairmont Place Henderson NV is located within MacDonald Highlands in Henderson Nevada. Below is some information about the community and the fine amenities it has to offer. 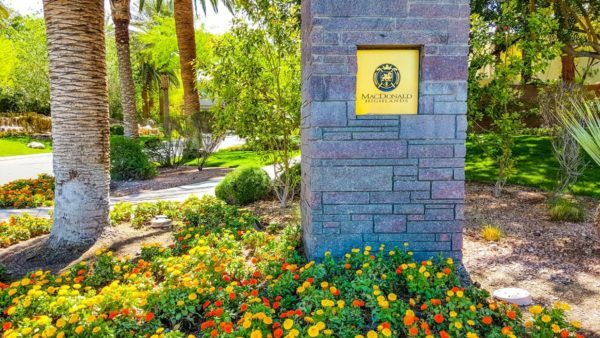 MacDonald Highlands is a collection of upscale neighborhoods in Henderson, positioned 2700 feet above the center of Las Vegas, offering some of the best skyline views in the valley. Filled with large custom luxury homes, MacDonald Highlands has become one of the most prestigious developments in Southern Nevada. Located within the community is Dragon Ridge private country club. This top rated course designed by Jay Morrish and David Druzisky, is tucked into the canyons between homes offering dramatic elevations and skyline views. Many top courses in the valley require tight target type golf with narrow fairways, however; Dragon Ridge provides a player friendly format with competitive greens. The DragonRidge clubhouse is a social venue for MacDonald Highlands residents. You will find the top-rated Montrose Steakhouse, Onyx Bar, Dragon Grill, two lounges and a ballroom to accommodate social events. Create stunning events like weddings, reunions and charity events with the backdrop of the Las Vegas valley. A custom-designed swimming pool that offers a magnificent view of the Las Vegas skyline is also available for the enjoyment of members of the upscale community. The Dragon Ridge Tennis and Athletic Center features two group exercise studios, private pilates room and a spacious 4,500 square-foot strength and cardio floor with a view of the Las Vegas Strip. Fitness class programs such as spinning class, pilates, yoga are offered on a regular basis. Child care services are provided. Members also enjoy sauna and steam rooms, whirlpool baths and an internet lounge. Private training, sport-specific conditioning and overall wellness services are also available on a per request basis. Five tennis courts, basketball, volleyball court and custom pool make it possible for the whole family to find fun and fit activities.